Once I discovered how well Kalamata olives go with eggs, it was all over. This Mediterranean Vegetable Frittata is an amazing breakfast that you won’t mind eating more than once. 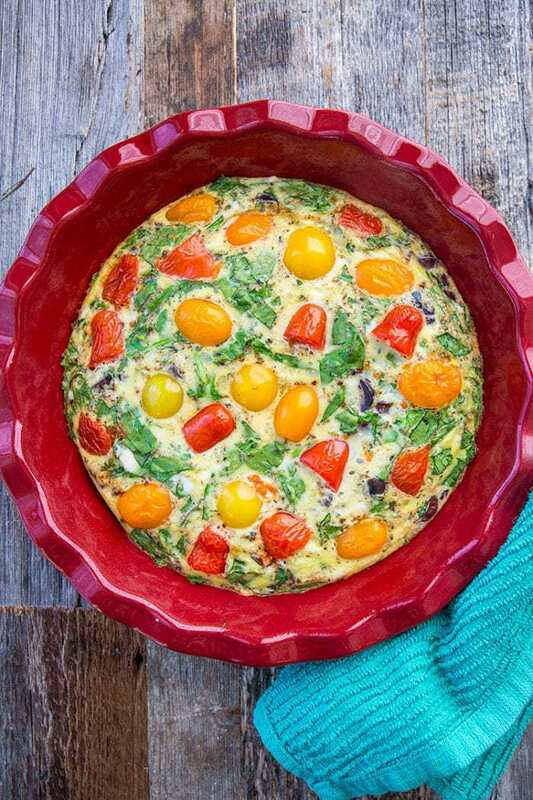 How do you make a Vegetable Frittata? You mix eggs with a little bit of cream or milk, add in your vegetables place it in a pie plate or a pan and bake it in the oven. If you are wanting vegetables that require cooking, you simply cook them first and add the other ingredients later. 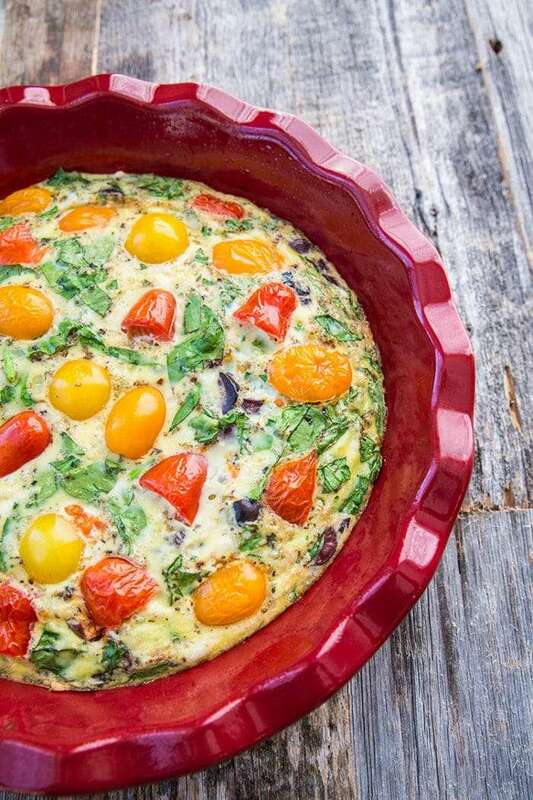 Frittata’s are that easy to make and are probably the easiest breakfast dish to customize. A frittata is an Italian dish made with fried beaten eggs, resembling a Spanish omelet. I traditionally make mine in a skillet or pie dish (as you can see here). Mediterranean Vegetable Frittata finished in a pie pan. What’s the difference between a frittata and an omelette? While both a frittata and an omelette are heavily egg based, the difference is that an omelette is cooked in a pan on top of the stove, then the fillings are folded into the middle of it. A frittata can start on the stove (frying vegetables etc) but will be moved to the oven to finish baking up. Not only that, in a frittata recipe the filling ingredients are mixed into the entire dish, not just the middle. It’s similar in some aspects to a quiche as well. Is a frittata a quiche then? No, the main difference is that a quiche usually has a crust while a frittata doesn’t. If you make a crustless quiche, you’ve pretty much made a frittata. Quiche also tend to have more milk and are more custardy than a frittata, this is heavy on the eggs, not the milky custard filling. One of the good things about this particular Frittata is the number of vegetables that it contains. It’s full on spinach, tomatoes and olives making it an excellent healthy dish for first thing in the morning. And let’s not forget that nobody is stopping you from eating this any time of the day either, there’s absolutely nothing wrong with that! Look at all those delicious vegetables. This vegetable frittata is teeming with them. 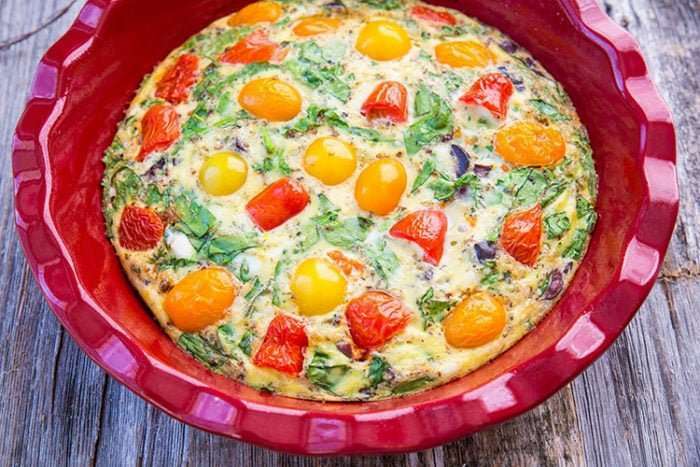 This Mediterranean Vegetable Frittata Recipe is perfect for those of you eating healthier! You don't have to be following the Mediterranean diet to enjoy this! Preheat oven to 400 degrees. Grease a 8 inch pie pan or quiche dish. Whisk up eggs and milk until well blended. Add in remaining ingredients and mix well. Bake for 15-20 minutes or until eggs are set.